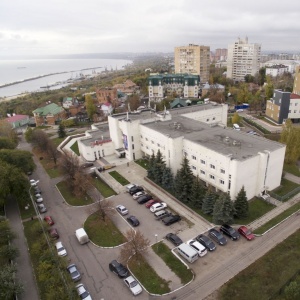 "Oktyabrskaya Hotel" is located in the centre of Ulyanovsk city, in a picturesque spot near Culture and Leisure Park. The hotel surroundings include - central city square, Drama Theatre, Arts Museum, Local Lore Museum, Books Palace, and Philharmonic Hall. The railway station, the shuttle bus station and both airports of the city are of easy reach for hotel guests. The hotel provides accommodation in 54 rooms of various categories. All rooms are comfortable and come fitted with everything required for enjoyable stay, including - TV with satellite channels aerial, air conditioning, fridge, mini bar, telephone, Wi-Fi Internet, bathroom with toiletry accessories. Dining is available at the cozy restaurant with 100 seats, offering exquisite European courses in a relaxed setting with light background music. The banquette hall with 35 seats can suit for hosting any festivities and special occasions. Also, guests can enjoy the warm and hearty atmosphere of the hotel's bar (open 24 hours), and enjoy a fine selection of drinks. Business people can avail of the state-of-the-art conference hall with 100 seats, cinema hall with 50 seats and visitor's hall with 25 seats for conducting any event. Meals for participants are available. On top of that, Oktyabrskaya Hotel provides - billiards, secured parking, business services, laundry service, gifts shop, latest newspapers and periodicals, taxi call, wake-up call, room-service and many more. Please be aware that information on services may be changed or updated by hotels without prior notice. Hotel reserves the right to charge registration fee if applicable and deposit for extra services upon check in. Fees are set by the hotels independently. Any information about rank or hotel stars is provided as notice information, in goals of general representation of the hotel level in terms of worldwide parameters, and is not consider to coincide with the State classification system of tourist industry objectives. Academservice is not responsible for unreliable and/or incomplete information.